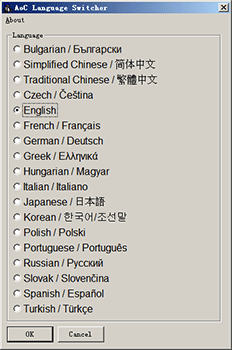 With this program you can switch between several languages for your AoC (also AoK) in great convenience. You may need different language packs if the language you use is not officially supported, or simply because you want to learn a foreign language while playing the favourite game. Anyway, with this you need not maintain many language DLLs in separate folders and need no backups. All useful DLLs are compressed as resources stored in this program. Once run, it will automatically detect AoC installation directory (through registry) and all you need to do is select your favorite language and press OK. File size: 3.26MB, 3,424,256 bytes. A little too big because it is hard to compress DLLs in different language characters. Program written by yty in Visual Basic 6.0. Some of the languages also include history files. English, ChSimp and ChTrad include campaign files as well. This utility is both unique and invaluable! Now a player can choose any language to play the game in with the click of a button. A must for those creating mods to be distributed to the public. As stated in the OP, the program has 18 language files compressed into it and can switch between each one. Instructions are included in the file description and the program itself is quite self-explanatory. One of the most potentially useful tools in a modder's toolbox, this program is a thoroughly recommended download for anybody seeking to easily switch the language of the game.